Over in the Not My Year Off house we have been mostly pottering about over the last week amongst trying to get up off our bums and organise some big things. Like Little Z’s 4th birthday party. I have to confess, so far I have done pretty much zilch and time is ticking on. With his birthday being close to Christmas I need to get super organised and super fast especially if I want cakes from the bakery that I love to bits. They have a talented team of artists squirreled away on the first floor of their shop. You don’t really see them very much. All the amazing finished creations find themselves being transported to the ground floor shop which smells COMPLETELY of glorious cake. In a week where we haven’t been overly productive I DID do one thing. I decided on the themes of his parties and have found (but not yet bought) party decorations and hats and banners and all manners of fun things. I have decided we are going to have one Minions themed party and one Olaf themed birthday. And I’m pretty proud of finally making the decision. So I just have to get a crack on now and get it all sorted! SO now its your turn. Come link up all your posts about any proud moment you have. Have you been like me and done not so much (besides a highly important decision?) Or have you reached a milestone that you’d love to share? 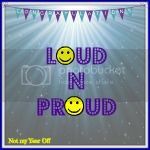 Loud n Proud is a linky all about your little and big proud moments, whether its about you or your family. All new and old, small and big posts welcome. Just grab the badge and use the linky tools below. The linky is open till Sunday night. This entry was posted in Toddler and tagged 4th birthday, Birthday cakes, birthdays, Cake, frozen, loud and proud, minions, Olaf, Parties, party. Bookmark the permalink. Ooh good themes, Minions are everywhere at the moment so that is a great choice. We are having Frozen and I spent a small fortune on party stuff yesterday. Olaf and Minions are great themes! I used to love it when my kids were younger and I could buy all the matching party stuff on a theme. And we need to see pictures of the cake, just so we an all feel jealous! The party themes sound like fun and it’s always easier to get organised once you’ve made the big decisions.